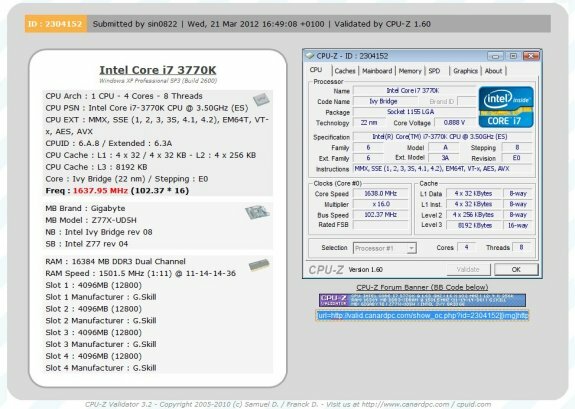 TPU reports overclocker Sin0822 achieved a DDR3 clockspeed of 3003MHz on a Core i7-3770K "Ivy Bridge" system with Gigabyte's Z77X-UD5H motherboard. Impressively enough, the feat was achieved with all four memory slots populated. At this clock speed, the test bench was just about stable for its CPU-Z Validation. Sin0822 took advantage of the 29.33 divider for memory, which is exclusive for Ivy Bridge, that Sandy Bridge lacked. The remainder of the clock speed target was met by a gentle bump in the base clock, to 102.37 MHz (from 100 MHz). To achieve a more stable setting in which stress tests can be run, the memory clock had to fall back to 1416 MHz.